Review by AllTheBestFights.com: 2018-03-03, disappointing fight between Kevin Lerena and Dmytro Kucher: it gets two stars. Kevin Lerena entered this fight with a boxing record of 19-1-0 (9 knockouts) and he is ranked as the No.17 cruiserweight in the world. He suffered his only loss when he faced Johnny Muller in 2014, since then he has won eight consecutive bouts beating Vikapita Meroro, Sergio Ramirez and Youri Kayembre Kalenga in 2017 (Kevin Lerena vs Youri Kayembre Kalenga). His opponent, Dmytro Kucher, has an official record of 24-2-1 (18 KOs=75%) but he is not ranked as he hasn’t fought since November 19, 2016 when he was defeated by Maro Huck (Marco Huck vs Dmytro Kucher); before this bout he had beat Enzo Maccarinelli (Enzo Maccarinelli vs Dmytro Kucher). 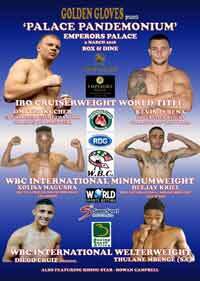 Lerena vs Kucher is valid for the IBO World cruiserweight title. Watch the video and rate this fight!